My writing career has given me the opportunity to talk with A-listers and mega-millionaires, but some of my favorite interviews have been with “regular” people—those who shy away from the spotlight and think of themselves as “normal.” When asked to share their stories, the conversations often begin with statements like those above. Their humility, though endearing, prevents them from understanding that their stories are powerful and invaluable to other “normal” people. It’s difficult for most people to imagine themselves as the CEO of a Fortune 500 company or a movie star. But an everyday person? They’re easy to relate to. They’re like you and me. They’re people who are “nothing special” but have learned or experienced something important—and their wisdom has the potential to benefit countless others… if only they’ll share it. The same scenarios hold true for our Christian stories; everyone has one. The “big-name” Christians tell their stories from the pulpit, on television, and in magazine interviews. Oftentimes, they are dramatic and exciting—taking us from the depths of despair to amazing joy, even tears. They are thrilling, well-rehearsed, and for some, difficult to relate to. Don’t misunderstand me. Without question, there is an important place for stories like these. They demonstrate the extremes to which God goes to make HIS story known. But what about those of us who grew up attending church, who knew from “cradle roll” classes that Jesus loves me and all the little children of the world? Our stories are often far less dramatic. Certainly, we were lost in our sin before we confessed Jesus as our Saviour. The joy of knowing we have Him as our Shepherd, Brother, and co-Heir thrills our souls. I don’t know your story yet. (I do hope you will share it with me!) What I do know is that if you are a Christian, you have incredibly important stories to tell. Yes, stories. Plural. God’s grace and power are not exclusive to a one-time salvation moment. Jesus is alive and active in your life every day! I believe it is as important to talk with Christians about what God is doing today and how the Holy Spirit helps us navigate this treacherous world, as it is to talk with people who don’t know Jesus yet. 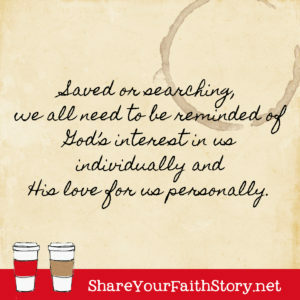 Saved or searching, we all need to be reminded of God’s interest in us individually and His love for us personally. Want help discovering your story? Read Get Personal and get the free Get Personal Story Journal. You’ll discover stories from your past and become more aware of how God is active in your life right now.